Seventy lawyers in Ontario and the U.S. have notified us that they received an email from the purported Akemi Koch looking to retain them with regards to a collecting overdue payments resulting from a separation agreement. Thank you for your prompt response. I am currently living in Japan and Warren Dave Koch (ex-husband) lives in Beverly Hills , CA. It is slightly difficult to reach you on phone as a result of the time difference (+13 hrs EST). Prior to our divorce, we agreed under a negotiated settlement agreement which is incorporated, merged into and made part of the court decree for a one-time payment of $933,380.00USD for Family support (this includes child support, alimony and medical support). To his credit, he has paid me $363,500.00USD but still owing $569,880.00USD and the due time for completion of payment is over. Attached is a copy of the separation agreement and Final Judgment. Thus, I request your legal counsel and representation to enforce the final judgment thereby compelling him to remit the balance owed me. He is aware of my intention to seek legal actions. I desire to retain your law firm, please forward your firm’s retainer fee agreement for review and possible appending of signature. I will be pleased to provide further information on this case on request. Just so you know, i share in the thought of payment of retainer fee prior to commencement of work. Thank you and have a pleasant day. 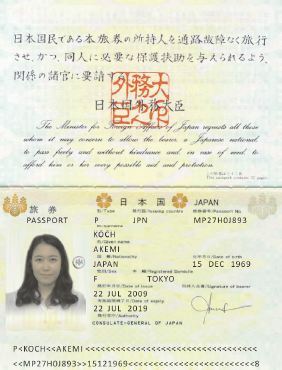 I received the same scam letter from “Akemi Kochi” AND a follow up reminder!! And I am not even an attorney. The cheapness of sending such garbage on the internet has encouraged these scammers. Thanks for the info! I have been receiving email of this nature for a while and was worried that someone posted my email address on some site as representing someone in the legal profession. Glad to know I can now call this JUNK and hopefully not see it in my inbox again! Yes I got a similar email from a “Maureen Gray” at that primus address in Austraila. I not only received the email but played with “her”. I am now the proud owner of a counterfeit JP Morgan Chase Bank Cashier’s Check! I can’t wait to frame it and put it on my “Wall of Shame”. I have now received two of these letters. I find it humorous that the Decree and Separation Agreement, which supposedly originated from a court in Japan, were written in English. I got this email as well in Minneapolis, MN. I reported it as spam. Thank you for the red flag. The documents are phony, as above noted. I got the check in the mail yesterday. It looks fake but the numbers seem so real! I reported it to the State Bar. I now have more interesting material to use to teach my students! Here’s my response to “Akemi Koch”. I’ll post if I get anything interesting back. Thank you for your email. I would be very happy to assist you in this matter. to ensure that it is genuine. Thanks for your due diligence I would have wasted my time responding to this scam. I goggled for the alleged dead beat and your information popped up. When it is too good to be true, mostly it is not true. Thank you for looking out. I just received an email from this person and google them and found this thread and warning on the internet. Thanks for protecting us. I just received my JP Morgan Chase cashier’s check in the amount of $489,250.00. I have been playing along for a while now after seeing this post. Thanks for the heads up. When I get these emails from scam artists, I reply to them and give them a link to the FBI’s website. Our law office in Newport News, Virginia, just received this same e-mail. One of the paralegals responded, but I caught it before he did anything else. I am now the proud owner of a $497,500 Chase cashier’s check…..will place it beside my $380,600 check. Just got mine too. Why a decree in Japan would be in English and full of mis-spellings is beyond me. I alerted “her” to the fact that her name and story are well known as fraud on line. Thank you! I googled her purported deadbeat ex and saw this site. Appreciate you saving me many headaches! We have had a similar case inquiry. The document is entitled Collaborative Law Participation Agreement. It is purportedly between Robert Maxell and Lisa Maxwell. Lisa Lucy Maxwell sent the request for representation against Robert for failure to pay balance of $848,000 settlement in the agreement. Sanzone Randolph is purportedly Lucy’s lawyer and Micheal Blake is supposedly Robert Maxwell’s lawyer. The document has The Great Seal of the State of California on it as well as purported signatures of the “clients.” The agreement is signed June 12, 2012. This fits the description of the scam perfectly but with new names. It even says the agreement can be presented to “the Court” (which court is not specified) if there is a failure to comply with the agreement. I did a google search for Koch, Akemi Koch, and Warren Koch and saw that this was phony, but was gratified to reach about this on your site. Thanks for the heads up. I received the same letter form Akemi Koch, except her “ex-husband” lives in Temple Hills, MD. I have a small practice and do not advertise, so I thought it strange to receive her inquiry. I responded back by asking how she heard of me. Of course, I received no reply to that, but the letter posted on your website. I googled her and your blog popped up. Thank you. I would not have proceeded with her “case” without confirming her facts, but thanks to you, I didn’t have to look far! Keep up the good work! I wish to Inquire if your firm handles motion for post- decree relief in Divorce Cases. Thank you for keeping this blog up and running, very helpful to weed out fraudulent emails! Just received the same string of emails from “her.” I am a small practitioner in NV. Once I indicated that I could handle contempt actions and attached the fee agreement and retainer agreement to the email a check showed up. She asked me to take my retainer out of the check. It all seemed too strange so I googled it and found this site. I received this same scam. Thanks for protecting me. I received the same email from “her.” What gave it away for me was the Korean characters in a settlement agreement that was supposedly done in Japan. Further, any settlement agreement in a Japanese court should be in Japanese and not in English. Does anyone know if Kiyoshi Tin is another one of those phony names? ex-spouse. Advice if your office is currently accepting new clients. I’m an attorney in Kansas and live within the Kansas City metro area. I, too, have receied the Koch letter….several times now. I have also receieved others of similar content all claiming a divorce in Japan and the need for collection help. Im glad you are posting about this. It’s obvious it’s bogus as the Japanese pleading are in English!! LOL. Still…..good work. This form of scam is quite popular across a wide front. I first encountered it when I tried to sell my BMW Z3 a few years ago. There the fraud was on a smaller scale but the same basic format. I was contacted by a foreig “buying agent” who had an overseas client who wanted to buy my car. He just happend to have a casier’s check from a failed “buy.” that check was several thousand dollars higher than my asking price. He wanted to send me that check and have me write him a check back for the difference. also, he would send an agent to get my car. In a perfect world I would be so happy to sell my car that I would immediately write a check for the difference and turn my car over to his agent. Silly me, I spoiled it for them when I told them I would have to wait for the cashier’s check to clear before I turned the car over. I even offered an escrow to hold the car. Turned out the check for bogus. I wish to inquire about a potential contempt of court against my ex-spouse. Advice if your office is currently accepting new clients. What got me suspicious was: I don’t know this person. Next, I did not recognize the university as being in Tennessee. In fact, the University of Mary Washington is in Virginia (of course, it still *might* have been a TN case). I do legal research for other attorneys (as a contractor) and as a solo, I do not advertise. Finally, I do not try domestic cases or work with lay persons. When I poked around and found this website, I was grateful I did not respond. The note is going straight to the junk file. My 2 cents. Great job of reporting this scammer. Keep up the good work! I received it today. Think there was something I may have answered yesterday. I told her to get a family law attorney — I’m a tax and finance attorney. I was suspicious from the start but until I found this site, the materials were holding up to scrutiny pretty well. I usually start by checking secondary name — they don’t exist and case closed. However, the wife’s attorney is a real person (maybe) who is a Japanese Prosecutor on leave with a Civil Law Firm to learn more about business transactions (I guess to prosecute white collar crime) or maybe it’s just a very good fake website for the attorney. Thanks for saving me from wasting more time on this stupidity. This “person” connected with our law firm on LinkedIn, sending the same bogus request. I have since reported and if you are a connection, be sure to block and also report. I wish to request for your legal services and possible representation on a legal matter involving child support enforcement in violation of a court order. Please do let me know if your office is currently accepting new clients. She’s already on my junk list. Wonder why a 2nd came through? Junk, junk, and further junk. Someone needs to teach her a lesson. Not me, not today. I received it today. I have seen similar before, and did not pay it much mind. Then I began worrying that others might not be aware, so did a search. I found you. The same thing happened in the past when there was a suspicious email around the same lines. We are so pleased that your site warns of the dangers. This is the second time that our office has been contacted by first, Kaycee Faunce with an address of [email protected] signed by Akemi. Then with a follow up email about needing help on collecting $569,880.00 USD from a settlement. I have forward this info to [email protected] and the FBI Fraud Department.